Today (October 25) is World Pasta Day, which was designated by the (U.S.) National Pasta Association, the Union des Associations des Fabricants de Ptes Alimentaires de la Communaut conomique Europenne (Union of Organizations of Manufacturers of Pasta Products in the European Economic Community), or Un.A.F.P.A. for short, and the associations of Venezuela and Turkey. Nothing like tooting your own horn, huh? On 25th October of each year, the world over, World Pasta Day is celebrated in the form of events and promotional initiatives in different countries of the world. The objective of World Pasta Day is to draw the attention of the media and consumers to pasta. Communication should underline the fact that pasta is a global food, consumed in all five continents, having unquestionable merits, appropriate for a dynamic and healthy life style capable of meeting both primary food requirements and those of high-level gastronomy. The key messages, recurring in the various communication initiatives, emphasize the economic feasibility, gastronomic versatility and nutritional value of pasta. Great. But how does this affect you? The Women’s Club of San Bernardino Supper Club is having a taco dinner from 4 to 6 p.m. tonight (October 23) at their clubhouse at 503 W. 31st. (at E Street) in San Bernardino. A taco dinner (with beans and rice) will set you back $10. The proceeds will help fund the club’s various service projects. For more info call 909-883-4029. Oh, how I hate giving away my secrets. But some secrets are too good not to share. Matano’s Little Italy, a tiny Italian deli in old town Yucaipa, is one such secret. A co-worker had told me about them, and my initial attempt to try Matano’s ended in failure when I got to the shop and saw a note that they were on vacation…for a month. Undaunted, I returned a few weeks later and am I ever glad I was persistent. I had the best sandwich I’ve had in a very long time. Spurred on by a “Grand Opening” ad (although I think they’ve been open a while) in The Sun, I wanted to check out Phoenicia, which has two locations in Redlands. So, after going to hear Dustin Lance Black speak at the University of Redlands, a friend and I went over to the Orange Street location (near Trader Joe’s). Phoenicia bills itself as having Greek and Lebanese cuisine. The ad mentioned a falafel sandwich combo ($5.95), which is what I ordered. My friend ordered one of the specials, the lamb plate ($8.95). The Orange Streeet location is a decently-sized restaurant, and a fairly well-appointed for a place where you order at a counter and the food is brought to your table. A while back, I had a chance to finally try Redlands’ Noodle 21 Asian Grill, which opened in late July. A friend and I went a little after the lunchtime rush and the restaurant was still packed. The restaurant has a very clean and modern design. It very much belies its strip-mall location. For my first meal there, I ordered the Com Tom Ga Nuong, which is a charbroiled shrimp skewer with chicken ($7.95). Leave it to me to order a noodle-free dish in a place called Noodle 21. My friend ordered the a large (and I mean large) bowl of the Pho Dac Biet ($6.95), one of their Vietnamese soups. We also ordered the fresh spring rolls ($4.95) to split. I’m hearing word that the Inland Empire’s only Golden Corral opened a while back and that the lines are still out the door. The new location is at 12845 Main St. in Hesperia, in the Super Target center. This is Golden Corral’s second foray into the I.E. since their restaurants in Riverside, Temecula and, apparently Hesperia as well, closed up decades ago. Have you been to the new Hesperia location? Feel free to comment below. The previously mentioned Boy Scouts of America, Grayback District 28’s “Scouting for Food” drive that took place earlier this month brought in 16,053 pounds of food. Over 250 scouts and over 150 Scouters/parents participated in the annual drive, which took place October 9 at 14 grocery stores in Highland, Redlands, Yucaipa, Calimesa, Beaumont and Banning. The food was donated to four local assistance agencies: Family Service Association of Redlands, the Redlands Salvation Army, Yucaipa Family Assistance and H.E.L.P, Inc. Thanks to the Grayback District scouts and thanks to all of you who donated! Follow the jump to see pictures from the event. I happened to spot this post in Wes Wood’s Claremont Now blog regarding the upcoming California Beer Festival on Saturday (October 16) in Claremont. For $40, you can have unlimited samples of local and no-so-local brews and listen to the music of live bands. If you’re the designated driver, a $25 ticket gets you a meal and non-alcoholic drink in addition to the entertainment. Among the breweries participating: Redlands’ Hangar 24 Craft Brewery, Upland’s Dale Bros. Brewery, Riverside’s Inland Empire Brewing Company, Rancho Cucamonga’s Omaha Jack’s Grillhouse & Brewery, Riverside’s Packinghouse Brewing Company and Riverside’s Big Cheese Pizza Company Brewery. With the price of gas these days, you could easily spend $40 just driving around to each of those breweries…not to mention the cost of the beer once you get there. Proceeds from the event will benefit the Dyslexia Awareness and Resource Center. The money raised will go to help children battling Dyslexia and ADHD. Doors open at 12:30 p.m. and beer sampling begins at 1 p.m. and runs until 4:45 p.m. The event ends promptly at 5 p.m. The festival is at 502 W. First St.
Tickets are available online, in Claremont at Hip Kitty Jazz and Fondue Lounge, Wine Merchants and Rhino Records at Eureka!Burger in Redlands. If the event does not sell out, tickets will be available at the door. And if you don’t have a designated driver, think Metrolink. 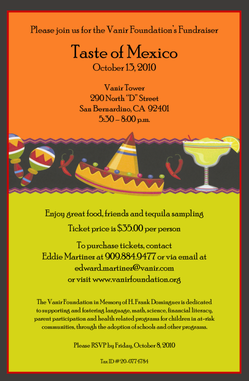 In the Dine 909 inbox today, we received a notice that there were still spots available for tomorrow night’s (October 13) Taste of Mexico fundraiser for the Vanir Foundation. The email was received about six hours ago, so time is of the essence. The event will take place from 5:30 to 8 p.m. at (not surprisingly) the Vanir Tower, 290 N. D St. in San Bernardino. Your $35 donation gets you dinner and tequila sampling. The Vanir Foundation is dedicated to supporting and fostering language, math, science, financial literacy, parent participation and health-related programs for children in at-risk communities, through the adoption of schools and other programs, according to the invitation. To purchase tickets, please contact Eddie Martinez at 909-884-9477 or via email to edward.martinez@vanir.com. No, this doesn’t have anything to do with older women chasing younger men. It’s a fundraiser for the Rancho Cucamonga High School girls basketball team. The Lady Cougars BoostHER Club (see what they did there?) is hosting the event from 5 to 8 p.m. tomorrow night (October 12) at the McDonald’s at 11198 Foothill Blvd. (just west of Milliken Avenue) in Rancho Cucamonga. Proceeds will help the team with transportation costs, tournament fees and equipment purchases.